Some say the spy thriller is a thing of the past, or at least it’s slowly dying as time goes on. Some of that is right. The “spy” has become somewhat irrelevant after the Cold War because the world’s standard on “bad guys” has lost a nation behind them, so there’s no established structure to infiltrate and spy on. Also, they are not as well funded as the spies of the Cold War era and can’t afford fancy gadgets and gizmos. For the last 20 years, the spy thriller genre has done two things to prevent its own demise. They’ve either kept their stories contained in the 40+ years where their genre thrived or (for the ones that couldn’t do that) have created fictional groups with more established structures for their spies to infiltrate. (Or just turned Russia into North Korea.) These methods have worked, but only to a point since the further we get away from the Cold War the less Russian villains even matter. They just don’t have the staying power of the dreaded Nazi, but soon the Nazi’s standard as the overall bad guy will probably fade too. The second method just doesn’t hold the same real-world gravitas since there really is no Hydra or AIM, so the threat is not as large as the Soviets. 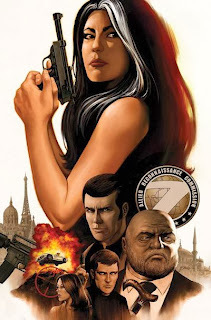 So, after saying all that, does Ed Brubaker and Steve Epting’s Velvet embrace the first or second method to try and bring back the spy thriller? And does it work? They use the first method. The story opens in early 1970s Paris where we meet agent X-14, your run-of-the-mill superspy who’s on his way to complete his most recent assignment when he gets shot down and killed in the line of duty. (Before you start to scream SPOILERS or anything like that this is not a spoiler. It happens on page 3, so calm down.) Our story isn’t about James Bo- I mean X-14, it’s about Moneype- (I did it again) Velvet Templeton, his secretary. She’s awoken very early in the morning to learn of X-14’s fall, and her workday at ARC-7 is consumed by figuring out who killed him. Through this process we’re introduced to other members of ARC-7, such as the Director (who looks suspiciously like Sean Connery), and other secretaries (who are reacting like we would expect Velvet to react … into their handkerchiefs), and Sgt. Roberts (the prickish Internal Affairs agent). Wait did I say Internal Affairs? Why yes, I did. 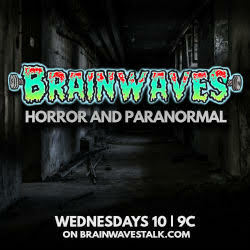 Through both Velvet’s own investigating and ARC-7’s, they find that X-14’s killer may be an ex-agent. Now that’s where I’m going to leave you, but I swear there are plenty more turns the story takes which make it out to be more than your average spy thriller. It’s a well-known fact today that Ed Brubaker is one of the great comic writers of our time. He revolutionized Captain America to the point that even though Cap has been around for 70+ years, the best story they could bring forth for the Captain America sequel is The Winter Soldier, which he wrote. (Just watched the trailer for the sixth time today.) 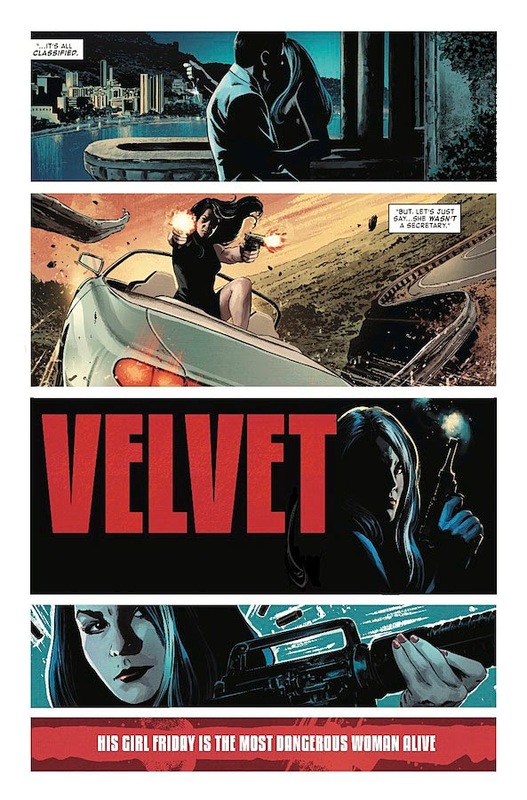 Brubaker is definitely in his wheelhouse when it comes to Velvet. I was never a huge fan of his other creator owned work, like Criminal and Incognito, but this feels a lot like his Captain America work to me. It has the same dark, gritty tone he brought to the superhero genre, but now brings to the spy genre. 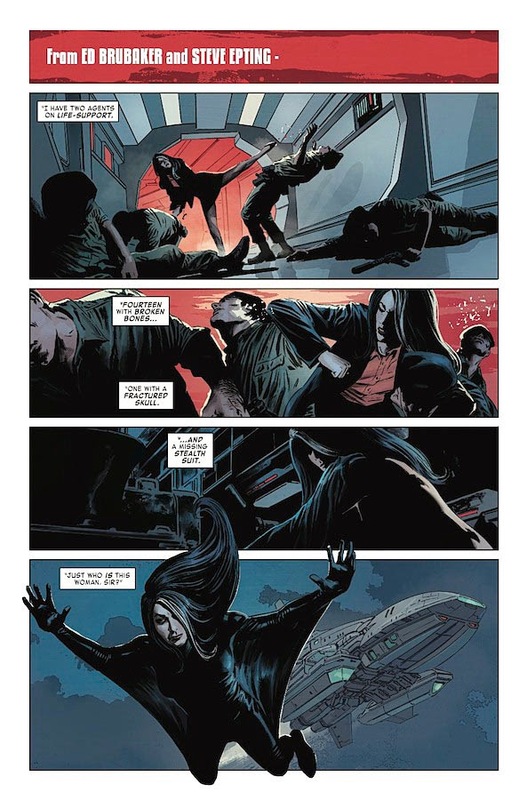 Velvet is a complex and strong character, and her reaction to X-14’s death alone sets the tone for the whole issue. She doesn’t cry and whine like his other past flirts do. No, Velvet decides to start digging for answers. Brubaker also does a good job in showing that there’s a history between her and X-14 without pounding us over the head with it. Greg Rucka is known for working within the same genres as Brubaker (they even worked together on Gotham Central), but Rucka is better known for his strong female characters, and it goes to show that Brubaker can also write one hell of a female lead with Velvet. 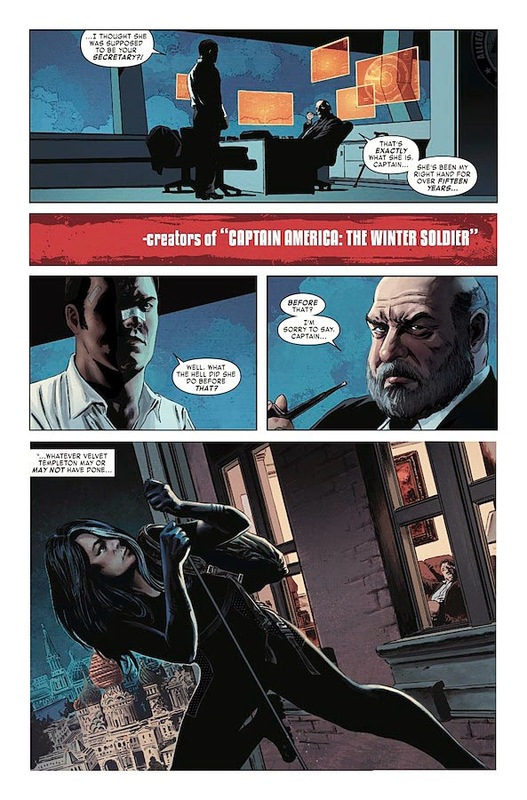 Previously, I made a lot of allusions (well more like straight up comparisons) to these characters and those of James Bond, and I think that‘s what Brubaker wants. We are so used to seeing Bond come in and be the hero, and either Moneypenny sits at her desk or screws up at field work (i.e. Skyfall), so it’s very interesting to see the roles flipped. Plus there are some differences between Velvet and Moneypenny that show that Velvet would never screw up in the field. Now I ask again, will Velvet rescue the spy thriller genre? Honestly I don’t think it can on its own. Although the story is well written and the art is excellently drawn, I don’t think it can save an entire genre on it’s own. 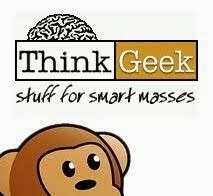 It is a great addition into the analogs of spy fiction, but it’s going to take a lot more from, not only books, but a world of new multi media projects to breathe new life into this slowly dying genre. Maybe if the terrorists take over a small nation and become a country, we could invade with no repercussions and the spy genre will return.